Enjoyed reading this article. I have three feeders out and hubby fills them up a couple of times a day. The cold has been brutal. 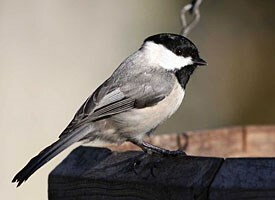 Never knew that about chickadees. They’re one of my favorite though. Mom used to paint them a lot on her wood crafts- I guess the color-blocking of them made them a little easier to paint..? I don’t see many birds besides giant crows here. Seriously the crowd are the size of cats. They’re scary! I love knowing that about your mom, thanks! Chickadees and Cardinals I think we’re her favorite. I know she did some blue and yellow colored birds as well but I remember chickadees for days! !